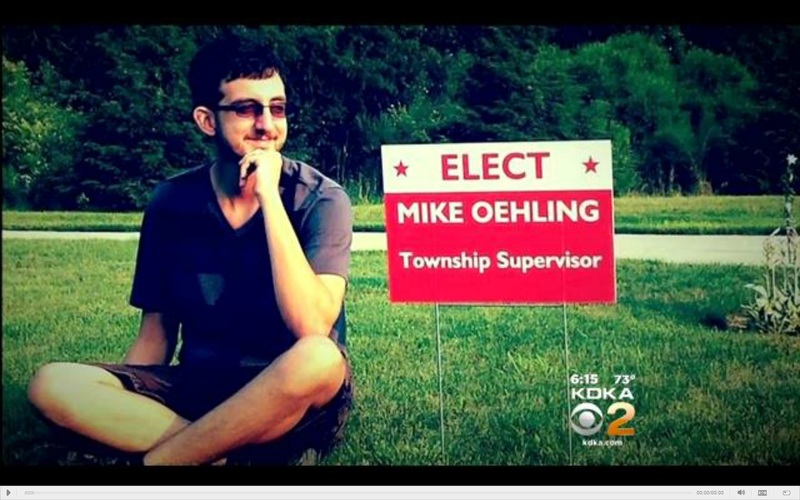 BUFFALO TOWNSHIP, Pa. -- A man running to become supervisor of one western Pennsylvania town is facing charges that he stole an opponent's campaign sign and led police on a brief chase -- while drunk, reports CBS Pittsburgh. Police say candidate Mike Oehling stole incumbent supervisor Gary Risch's campaign sign Sunday morning. Moments later, a Buffalo Township police officer saw a car drive by with the wooden sign sticking out the back, and an unidentified man on the outside of the car, clinging to its partially open hatchback door, reports the Pittsburgh Tribune-Review. A brief chase ended in candidate Oehling's driveway. Police say there, Oehling yelled that it was his constitutional right not to obey the police commands. After a struggle, Oehling was in the back of the police car, where he is accused of kicking an officer repeatedly. Oehling's confrontation with police seemed to echo a video he posted to Facebook in January. "The Constitution was written to keep the government off the people's backs. Why is the government all over ours? What happened to freedom?," Oehling asks in the video. Oehling faces charges related to drunk driving, theft, eluding police, reckless endangerment, resisting arrest and assaulting a police officer. Supervisor Risch, whose sign was stolen, said it wasn't the first time. "Friday night he took the other signs I had up in the township, I had about 10 signs up, and I think it's kind of childish," said Risch. "If the kid needs help, I'd like to see him get some help," said Risch, of his 23-year-old opponent.